Fast forward to the start of the 2007-08 season and don’t be surprised if the grand marshal for the third annual San Jose Grand Prix is heard uttering the same instructions to his teammates. Because for the 28-year-old captain of the San Jose Sharks, even though the ride has been quick to this point, Marleau’s in it for the long haul. Marleau, who originally wore No. 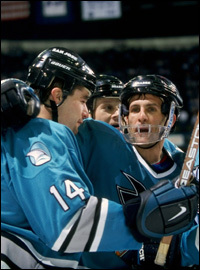 14, played along side Tony Granato (right) from 1997-2001. It’s almost hard to fathom that Marleau is entering his 10th National Hockey League season. If not for the lockout of 2005, this would be season No. 11 for the native of Swift Current who grew up in tiny Aneroid, Saskatchewan. Marleau was just 17 when he took part in his first training camp with the Sharks, who made him the second overall pick not even three months before during the 1997 NHL Entry Draft. Seemingly before the ice melted on a superb junior career as a member of the Seattle Thunderbirds of the Western Hockey League, Marleau was embarking on fulfilling an NHL dream against players twice his age. “When you’re playing with him, you don’t realize how long he’s already been playing and how long he still has,” goaltender Evgeni Nabokov said. “I think he’s only going to get better and be a leader for many years. Marleau made the team just weeks after his 18th birthday following that first camp and appeared in 74 games while skating as the NHL’s youngest player during the 1997-98 season. Some of his first-year teammates included John MacLean, Stephane Matteau, Murray Craven, Bernie Nicholls, Tony Granato, Joe Murphy, Shawn Burr and Al Iafrate. Marleau’s 13 goals and 32 points were enough to place him fourth in scoring on a team that qualified for the playoffs for the first time in three seasons. Only six other players from Marleau’s first team were active in the NHL last year. Between his second season of 1998-99 and the year before last of 2005-06, Marleau never missed more than three games in a season and appeared in 567 out of a possible 574 regular season contests. Along the way, the 6-foot-2, 220-pound center established franchise records (entering the 2007-08 season) for career goals (219), assists (272), points (491) and games played (717). And had it not been for the lockout, Marleau would have been the youngest player in NHL history to reach the 700-game plateau. As it is, he was the eighth youngest at 27 years, 162 days. All these accomplishments on the ice and he’s just entering the prime of his career. Married and the proud father of a young son, Marleau may still be short of the halfway point to his sparkling career. Many agree the best is yet to come. “I think he’s just coming into the prime of his career,” Executive Vice President and General Manager Doug Wilson said. “He’s taking over the leadership role that comes with being a captain. 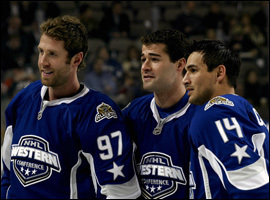 Sharks forwards Joe Thornton, Captain Patrick Marleau and Jonathan Cheechoo were all selected to represent the Western Conference at the 2007 NHL All-Star Game in Dallas. “The thing about Patty is how much be cares,” he added. “He’s put up some really good numbers, he’s got more (to give) and it’s now at the point in which he can apply some of the experiences he’s gone through. Marleau signed a two-year contract extension less than two weeks before training camp, insuring his stay in San Jose will last at least through 2010. Marleau’s not the boisterous kind. In fact, he’s very humble. You won’t catch him talking about himself or what he’s achieved in Teal. All that matters to him: winning a first Stanley Cup for the city of San Jose. “The last three years we’ve had a little taste,” Marleau said. “That part is a little frustrating, but we’ve got to stick with it. Each year I think we’re getting better as players and hopefully we’re getting better as a team, too. Facing public criticism following the Sharks playoff ouster to Detroit last spring was also a first for Marleau. The 2006-07 season ended sooner than expected, especially because San Jose had a 2-1 lead in games against a Red Wings team that didn’t have momentum in the semifinal series until tying Game 4 late in regulation and winning in overtime. With losses in the next two games, the Sharks were shockingly out of the postseason for a third straight spring. Goals were not met, expectations fell short and it was an emotional time. Marleau had a fantastic first round for the second straight spring against Nashville, scoring three goals and six points. The Predators were left shaking their heads when it was Marleau who scored the series-clinching goal in Game 5 for the second straight series. Marleau is the franchise's leader in games played, goals, assists, points and game- winning goals. But what came seemingly easily against Nashville didn’t happen at all against Detroit. Marleau didn’t manage any goals or points and found himself on the ice for a couple pivotal goals against — a short-handed goal that turned around Game 2 and the most pivotal late-regulation tying goal by Detroit when the Sharks were otherwise poised to go up 3-1 in the series. The captain faced scrutiny after that game and after the series when the events were analyzed over and over again. No one suggested in print that Marleau strip himself of his captaincy as was unceremoniously thrust upon an undeserving Thornton on the eve of an eventual Game 7 quarterfinal series loss for Boston against Montreal in 2004. But Marleau did have to read that his coach, Ron Wilson, was disappointed in his play. That’s what others are counting on. “I think he will react and respond very well,” Doug Wilson said. “This is a game where you want passion and emotions. The frustrations of not meeting all the goals we set, emotions bubble up a little bit and I’m not sure that’s bad. “I know from being around that if we go a week not playing up to what others expect and what we expect from ourselves, it gets magnified,” veteran center Curtis Brown said. “The big thing isn’t so much scrutiny or coming down on Patty. It’s about inside the locker room and a team that didn’t accomplish what it set out to do. "The last three years we’ve had a little taste,” Marleau said. “That part is a little frustrating, but we’ve got to stick with it. Each year I think we’re getting better as players and hopefully we’re getting better as a team, too." Early in his career, Marleau experienced scoring droughts and periods of inconsistent play, which is consistent with any great talent that’s still learning and adapting to new challenges. But Marleau is no longer one who falls in that trap. Running “Captain’s Skates” during the summer, Marleau was focused on the start of this season just weeks after the last one ended. 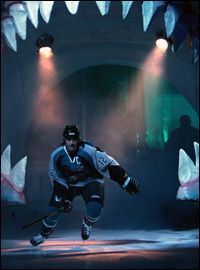 Veteran Bay Area hockey reporter Ross McKeon has covered the Sharks since their inception in the 1991-92 season. He currently covers the Sharks for The Hockey News. He recently joined Yahoo! Sports as their NHL editor/writer.